Artega has debuted a new boutique sports car that is all-electric and has technology at its very core. Unveiled at the Frankfurt Motor Show, the Artega Scalo has an engine that will be fit for any speed freak and a range of gadgets and gizmos to make driving the beast even more enjoyable. Under the bonnet there are two Voltabox synchronous, water-cooled electric motors that bring 300kW (or 402bhp) to the table plus 575ft-lb (779Nm) of torque from a 37kWh lithium-ion battery backed by powerful super-capacitor banks. Artega boasts that this allows the Scalo to do 0-60mph in 3.6 seconds and it has a top speed of 155mph. Helping it achieve those speeds is a carbon composite body that takes on a sleek profile and there is an automatic electronic rear spoiler that has extendable flaps and makes sure that aerodynamically-speaking it is always able to hit the heights on the speedo. Range-wise it can do 250 miles per charge and the 64kW DC quick charger gives it a full recharge in under an hour. Inside the car is where things start to get even more interesting though. Stepping inside the supercar for the first time you'll find a large curved central OLED display that is split in two. At the top sits Apple CarPlay as standard and below that various pieces of in-vehicle information is relayed to the driver. On the entertainment front, Paragon has laid on an 800W, 13-speaker system plus a set of microphones in the driver's side seat belt that are placed there to give a more successful hands-free calling experience. If you like the sound of that and don't mind the €170,000 (£123,700) price tag then you'll need to be quick off the mark. 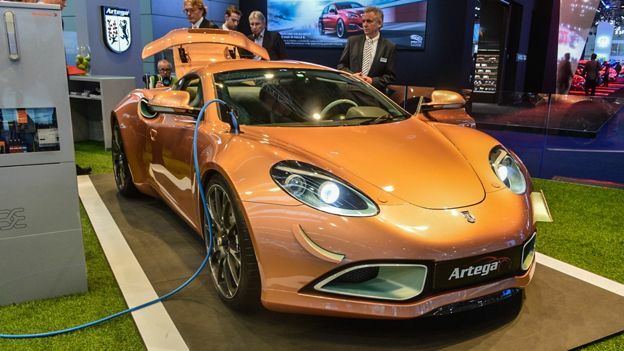 Artega only plans to make a dozen units for sale in Europe next year. Good luck!